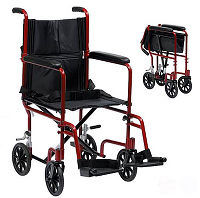 A transport wheelchair is a lightweight, foldable and portable wheelchair that is perfect for taking your elderly parents to places that involve too much walking for them. Some families keep this type of wheelchair in the trunk of their car specifically for trips to the mall, the park, to Doctor's appointments or just to walk around downtown. Transport wheelchairs are much easier to get in/out of the trunk than a regular light weight wheelchair - which can be a struggle even for me. Most are under 20lbs and fold up to easily fit into the trunk of a car. Transport wheelchairs are designed to be pushed (rather than self propelled by the user). They have 4 small wheels, brakes, foot rests and a cloth (hammock style) seat and back. Transport wheelchairs allow elderly to go to places they would not be able to walk to (due to decreased strength, endurance and/or balance). They are lightweight (most under 20lbs) and foldable, making them easy to put in the trunk of a car. They also make great travel wheelchairs as their small size allows them to be checked as baggage when traveling by plane. Some of them even come with their own bag that is the size of a suitcase. They are great for elderly who have decreased strength, endurance and balance that make it difficult to walk longer distances. They are meant to be pushed by another person and not self-propelled like a light weight wheelchair. Elderly who may benefit from having one may walk around the house or for shorter distances but need a transport wheelchair for safety when going outside or to a doctor's appointment. They are not meant to be an alternative to a light weight wheelchair which is designed for elderly that will spend more time in it and need to be able to propel it themselves. Independence - They are designed to be pushed by another person and difficult to self-propel. Not designed for custom cushions/backs - They are designed for using on short trips where the senior will only be in it for a few hours at most. Not designed for all day/everyday use - A light weight wheelchair is more appropriate for this. 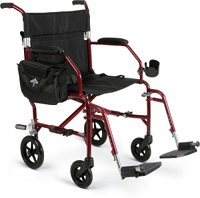 Need someone to push wheelchair - Sometimes it is not an option to have a family member or friend push the wheelchair as they themselves have health issues. Need someone to put in the car - Sometimes a family member or friend is not available or able to lift anything (even a light transport wheelchair). Brakes - Some brakes are on the wheels which can be difficult to reach. 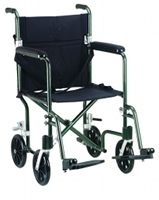 Other manufacturers have placed them at the handles (similar to rollator walker brakes) which are more convenient. 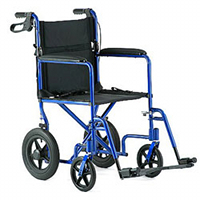 Lightweight - The main advantage of this type of wheelchair is it's portability - so make sure it is light (under 20lbs) as it makes it easier to put in/out of the car. Sturdy - Make sure it is well built and there are no loose parts. Mid sized wheels - They should be about 8" in diameter. Much smaller will make it difficult to roll on uneven ground and get stuck on small rocks/gravel on the sidewalk. Removable leg rests - The leg rests should be easily removable as it makes getting in and out much safer with the leg rests removed. Cushion - They do not always come with a cushion but it's a nice feature to have and fairly affordable (~$50 for a simple foam cushion). Cushions - Cushions ranging from simple foam to more advanced gel and air models. Umbrella holders - Keeps everyone dry and happy. Drink holders - Useful for trips to the beach, park or shopping. Bag - To attach to the wheelchair to carry items. Carrying bags - To carry the wheelchair when it is folded up. Seat belt - Some seniors feel more secure with a seat belt. There are three main measurements to fit a transport wheelchair. For the seat size, it's helpful to know the hip width and thigh length. For the seat height, it's helpful to know the measurement from the back of knee to the ground. Most transport wheelchairs have a floor to seat height of 19" but there are some models available with an 18" seat height. You can use a flexible measuring tape or use a piece of string to obtain the length and measure it against a yard stick or carpenters measuring tape. The easiest way to measure your loved one is to have them sit down in a chair. Seat height - Measure from the floor to the back of their knee (while wearing their regular shoes). It is also a good idea to keep in mind how high the armrests are if your loved one is on the small side (~5'2" or less). Some of the armrests are quite high and would be uncomfortable to sit in for too long. Make sure the brakes are on. Make sure the leg rests are removed so they do not trip anyone. Have the senior back up till they feel the wheelchair behind them. Have them reach back for the armrests and sit down. Put the leg rests on. Release brakes and roll away! It's important to put the brakes on anytime the senior is getting in or out. A transport wheelchair can cost $125 to $600, depending on quality and features. Light weight wheelchair - A wheelchair for more regular daily use - two large wheels and two small wheels making it possible for the elderly to self-propel. Reclining wheelchair - A wheelchair that has a reclining back to improve comfort and positioning. Motorized wheelchair - An electric powered wheelchair designed for elderly who cannot propel a standard wheelchair themselves. Shower wheelchair - Designed to get wet and roll into an accessible shower.